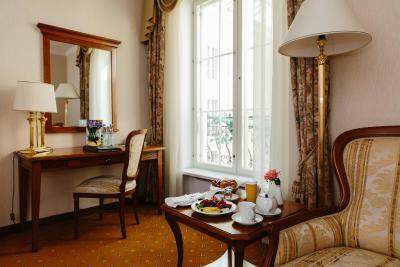 Lock in a great price for Grand Hotel Emerald – rated 8.6 by recent guests! The staff is extremely attantive and helpful. 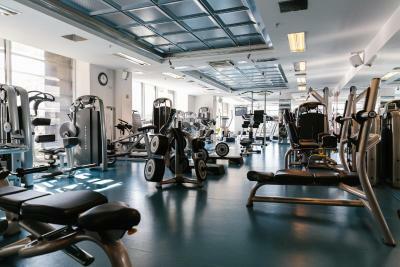 The gym is excellent with a perfect connection with hotel. The breakfast was also amazing: salmon, butter fish, pancakes etc. Thank you for great stay! Corporate hotel good for a one night stay. Very comfortable with a good breakfast. Very friendly Staff, The food was amazing (02:00 am room service). Staff were extremely polite and helpful! Gym and spa/pool facilities are superb! Очень понравился персонал . Приветливый, все просьбы выполнялись моментально. Чистота в номере. Понравился спа комплекс. Очень вежливый и отзывчивый персонал. Очень вкусная кухня, есть постное меню, есть возможность внести изменение в рецептуру блюда при индивидуальной непереносимости каких-то компонентов, чистый спортзал, очень качественная уборка номеров. Нормальный в общем отель хорошего уровня, очень симпатичный внутренний дворик. 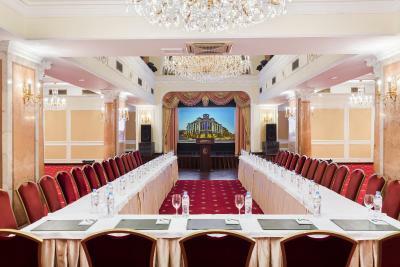 Grand Hotel Emerald This rating is a reflection of how the property compares to the industry standard when it comes to price, facilities and services available. It's based on a self-evaluation by the property. Use this rating to help choose your stay! 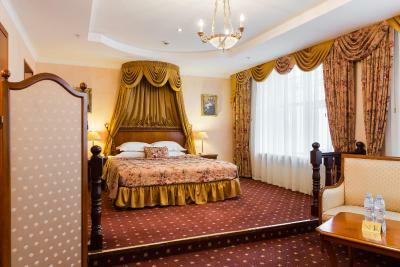 One of our top picks in Saint Petersburg.The Grand Hotel Emerald is only a 10-minute walk from the Metro Station Ploshchad Vosstaniya and 10 minutes from Nevsky Prospekt, close to the Smolny Cathedral and the Taurida Garden. 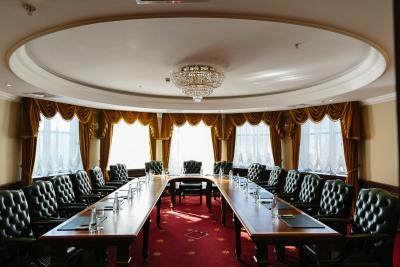 The Grand Emerald features grand, classic interiors. Free WiFi is provided. A gym and aerobics classes are available. 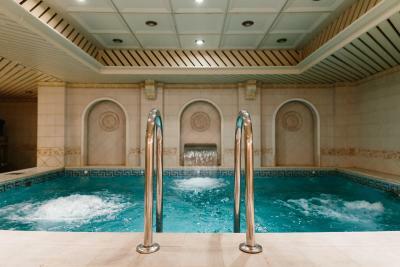 Relaxation is offered at the spa, which features Russian and Turkish baths and a hot tub. Treatments can also be booked at the Barhat Beauty Studio. The Gzhel Restaurant offers traditional Russian cuisine. Drinks are served in the bar. 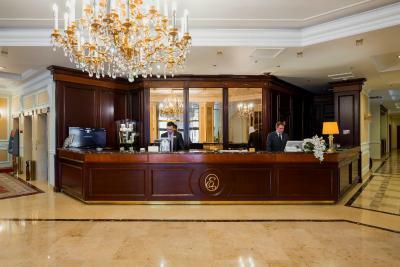 When would you like to stay at Grand Hotel Emerald? Air-conditioned room includes a TV and a minibar. Features a seating area and a spa bath. A tea set is available for guests. This spacious suite offers a bedroom and a living room. A coffee machine as well as a tea set are available for guests. The private bathroom includes a jetted shower cabin with a sauna mode. This suite offers a bedroom, living room and study. A coffee machine and tea station are available. The private bathroom is fitted with a spa shower with a sauna mode. 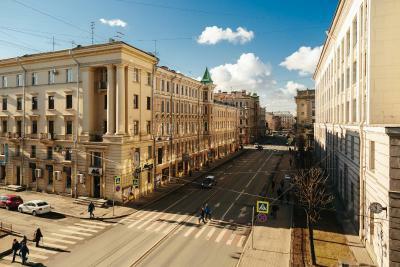 Hotel surroundings – This neighborhood is a great choice for travelers interested in museums, culture and ambiance – Check location Great location - show map Guests loved walking around the neighborhood! House Rules Grand Hotel Emerald takes special requests – add in the next step! Any additional older children or adults are charged RUB 3100 per night for extra beds. Grand Hotel Emerald accepts these cards and reserves the right to temporarily hold an amount prior to arrival. Please note that the property provides free visa support for guests. Guests who cancel their reservation will be charged RUB 1850 for each visa support letter completed by the hotel. Guests have free use of the swimming pool from 07:30 to 10:30. (from 8:30 to 10:30 during weekends and state holidays). 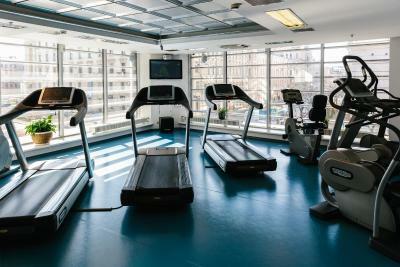 Guests have free use of the gym and sauna from 07:30 to 23:00 (from 8:30 to 23:00 during weekends and state holidays). The reservation of all spa complex is required after 13:00, for extra charge. Please note that the full payment may be required upon check-in. If booking 6 rooms and more, different policy might apply. The hotel will contact you directly. The seventies style. It looked like the rooms weren’t touched since 1970. Swimmingpool only available during morning hours. 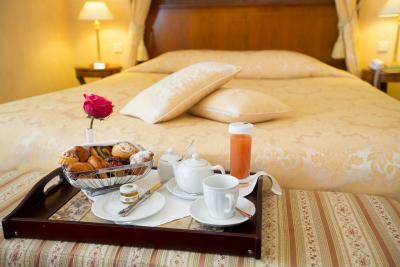 Be careful with using of wellness- it's included to the room just in the morning time. Afternoon it's payable separately approx.60€/hour.